Creative In Counters is an independent distributer of CaesarStone. CaesarStone is the original quartz surface manufacturer, offering over 40 innovative colors and textures. CaesarStone consistently provides a premium quartz surface with remarkable style and endurance – complementing a design application, from classic to contemporary. Nonporous, stain, scratch and heat resistant and backed by a residential lifetime warranty, CaesarStone is the ideal surface for kitchen countertops, vanity tops and more. Trendsetting: Available in over 40 innovative colors and textures with endless design capabilities. Natural Beauty: Caesarstone is 93% natural Quartz. Non-Porous: No sealer needed, mold and mildew resistant. Durability: Caesarstone is heat-, scratch-, and stain-resistant. 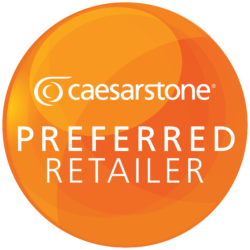 Cost Effective: Caesarstone lasts a lifetime, so you do not have to replace it – EVER. Low Maintenance: Soap and water is all that is normally required to clean Caesarstone. Lifetime Warranty: Covered for Life. Eco-Friendly: Caesarstone is committed to protecting our environment. From investing in recycling technologies to embracing environmentally sensitive suppliers.